Fear Island in Ingoldmells is officially open for the Halloween season - and Mayor of Skegness Coun Sid Dennis was among the first to explore what terror lies beneath the attractions at the theme park. "I was so scared all my hair fell out," he joked to the Standard after a preview tour of some of the Fantasy Island's Halloween attractions last night - Psycho Mansion, the Chamber of Freaks in Canivhell and Temple of Terror. Mayor and Mayoress of Skegness Coun Sid Dennis and Mrs Marie Dennis with the cast of Psycho Mansion. There was also entertainment in the pyramid by the Wonder Circus' Mr Fips and the cast of Circus of Screams, who had been unable to perform, in the pumpkin tent on the night due to the high winds. Coun Dennis, in thanking Fantasy Island for putting on the show, said: "It's been brilliant - very, very flashy lighty, very very claustrophobic - families won't forget it! It's obvious a lot of work has gone into this - the characters are really good." The Standard asked him how Fantasy Island managed to get planning permission for Psycho Mansion - not the most attractive of buildings. . 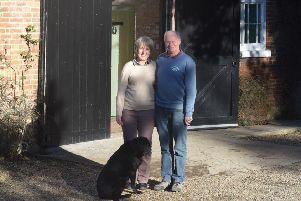 He laughed: "You don't need planning permission for something that's portable and I'm led to believe it is.."
He added that it was his 44th wedding anniversary and admitted he and his wife, Marie, had both forgotten but had had lots of fun. "I clung on to Sid," said Marie. "I don't like scary things."